So, with two sections left I figured it was time for an update. This section has an entire house attached to the inside wall, again with a detailed interior. There's even a fireplace. 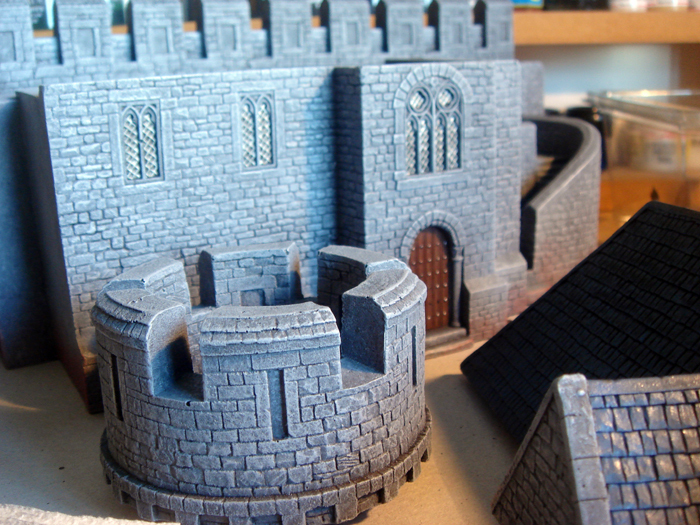 I reckon I'll finish this tonight, leaving only the main gatehouse left to do. I won't be awful sorry to be finishing this project. 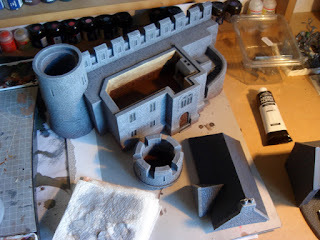 It's a gift for a friend, and it's great to have worked on a castle, and I've learned a lot while doing it, but I'm ready to be finished now. However, in the near future I'm very much looking forward to sending some siege towers into it packed with hateful chaos dwarf warriors and burning the place to the ground. You can tell I'm missing my fimir, can't you? Speaking of which, you can just about make out the half-dead in the top right of the picture below, untouched and unloved, but this state of affairs will be changing in the very near future. I'll pop up a shot or two of the finished castle next week, and we'll be back full tilt into fimir production. I've picked up some rather tasty Celtic-style shields from Scibor I'm really looking forward to using on some upcoming fimir heroes, but more on that later down the road. 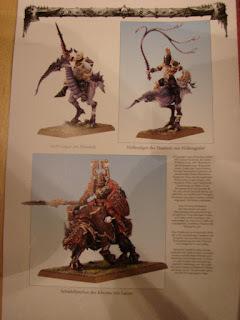 The skullcrushers and hellstriders look pretty much how I thought they would. It's nice to see some of the special characters finally getting a model, Festus looks interesting from what I can make out. 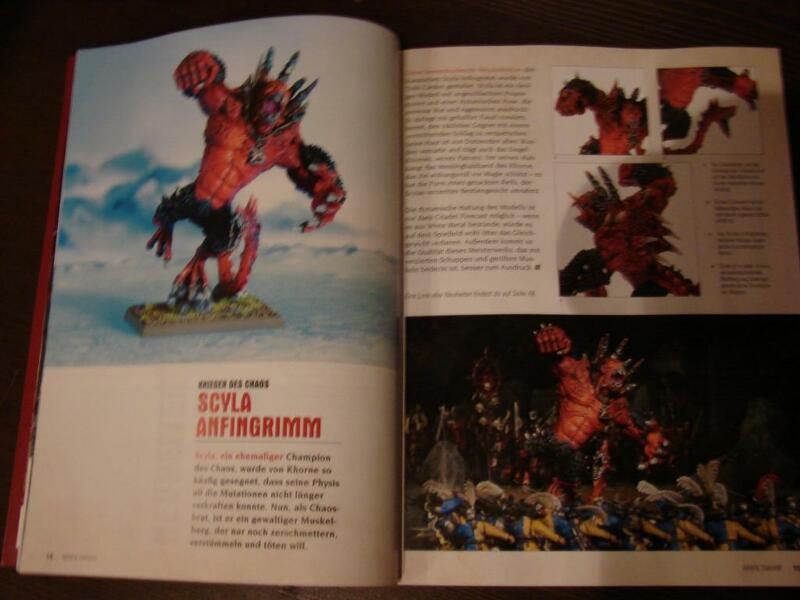 Scyla, when I saw the model list earlier, I thought would be a finecast re-issue of the existing model, but no, he gets a new rather enormous incarnation. Also, he looks like he's just about to lose his footing in a most embarrassing manner. "Blood for the blood GoaaAAaargh! My back!" The warshrine is what gets me excited though. Looks rather good, though it's a little too ostentatious I think. I imagine there's a fair amount of bits in there, and as I'm building a fimir army using the warriors of chaos list, I think a good amount of conversion potential. Those mutated bearer guys could make fine warp-spasming fianna fimm with a little convincing. Certainly a kit I'm considering picking up. 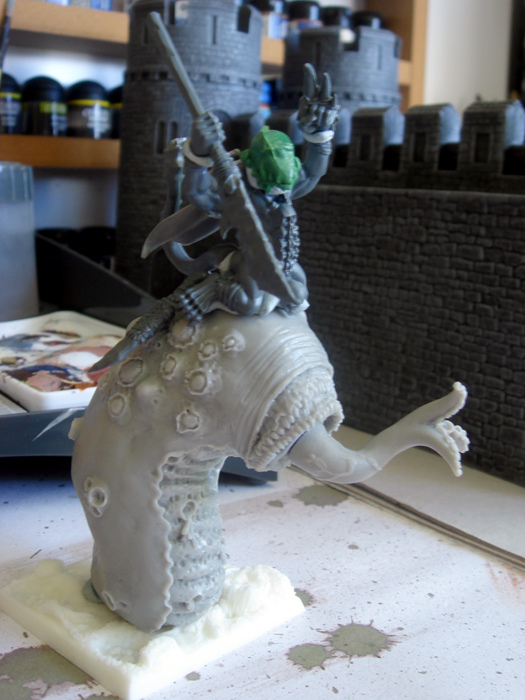 My plan for some marlwyrm riders to use as skullcrushers looks like it'll be happening. Six, I think. 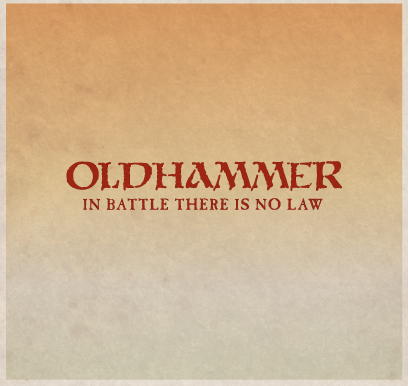 They are rare though, so will be competing with warshrines and hellcannon. Here's some rules. 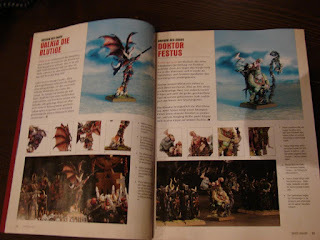 Games Workshop have just released a whole big sackful of FAQ's, with some fairly major changes. The biggest one is the changes to overrun as far as I can see. Now, any unit with the daemonic instability or unstable rule, or war machines failing a break test don't grant an overrun if the unit is destroyed as a result of these rules effects. Massive. I'm very surprised that the ruling went this way, it makes daemons and vampire counts units more powerful, and it's going to be much harder to roll an artillery line. 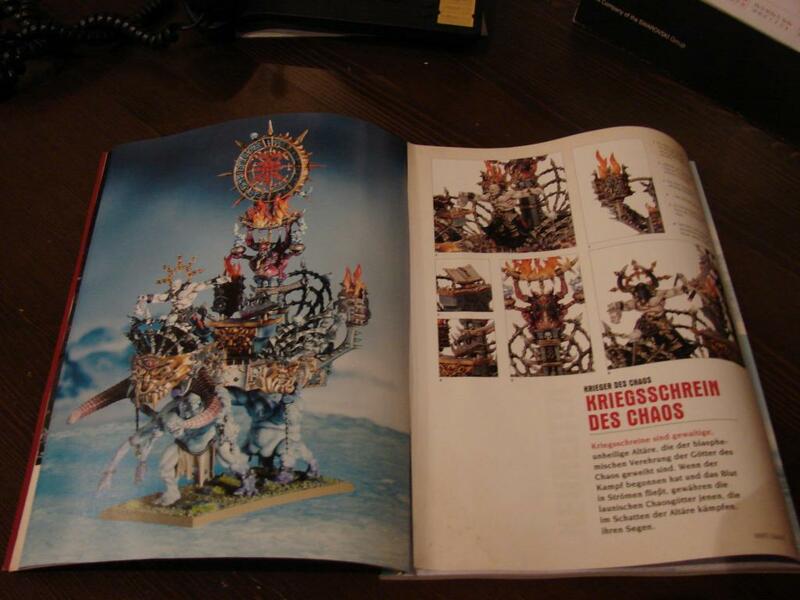 I can see my single spirit hosts getting more table time and small dire wolf units making a triumphant return. There's a pile more changes, monstrous cavalry now use the monsters toughness, and from the other FAQ's, nice titbits are the banshee can now scream into a combat she's not in, which clears that up. There's also a nice change for the tomb kings in that units with the entombed beneath the sands rule can now choose to deploy normally. Every little helps, I guess. 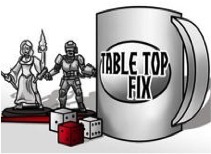 Bad Dice Daily review the FAQ's today on episode 111. 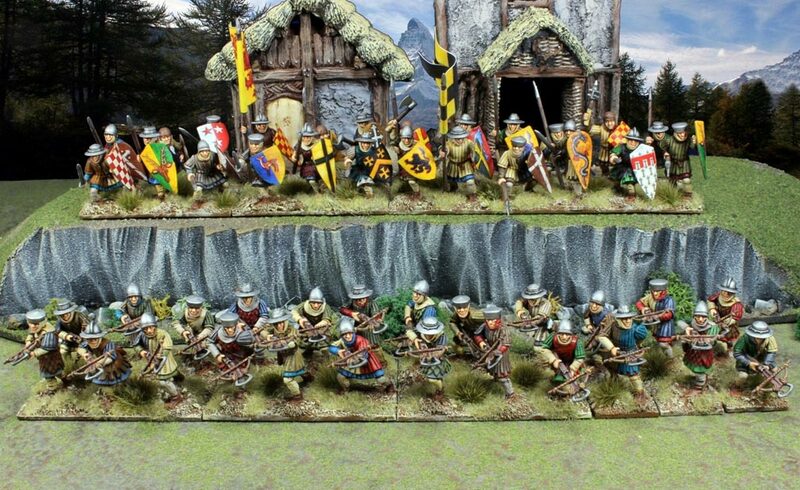 I just spotted these over at Wargame News and Terrain, a rather tasty box of medieval infantry. Beside their obvious historical uses, they are perfect for those Bretonnian players looking to bulk out the men at arms. At €35 for 48 models, you can't argue with the value, and they look to be nice models from what I can see on the site. They have a lot of options, spears, crossbows, swords, axes and maces. From my point of view a box of these and a box of skeleton warriors and you'd have great fun kit-bashing a unit of armoured skeletons or zombies for your vampire counts armies. Check them out at Fireforge games. There are also mounted sergeants, Teutonic knights and Templar knights, so you could pretty much build your whole Bretonnian army there bar a few extras. 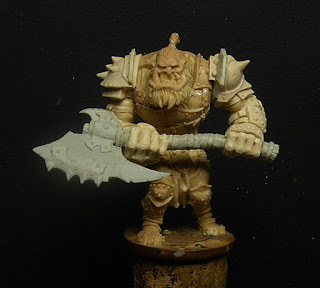 Mantic's ogres are on the way. 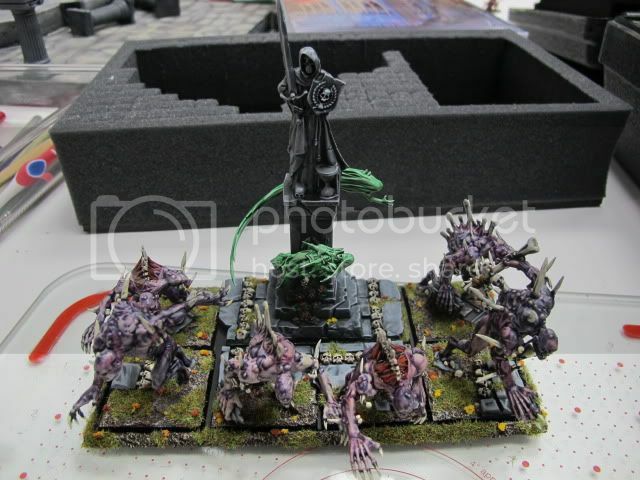 Mantic had some of the new sculpts from their kickstarter on display at their open day. I have to say, they look good. The heads are very good indeed, I wonder if they'll be available as bits? I could see them selling very nicely. 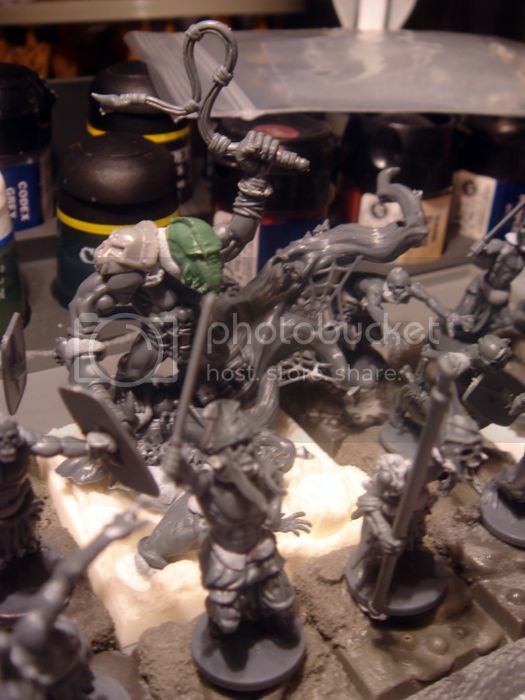 It might be the angle, but the ogre with the great axe looks like he needs a wee. Apart from that though, he looks like a nice sculpt. I have high hopes for the werewolves. 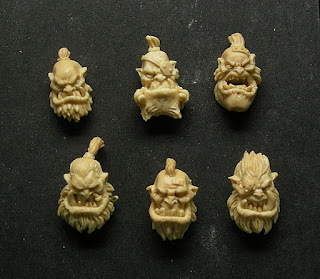 If they are as good as the ogres look like they are going to be I'll be having some for certain. 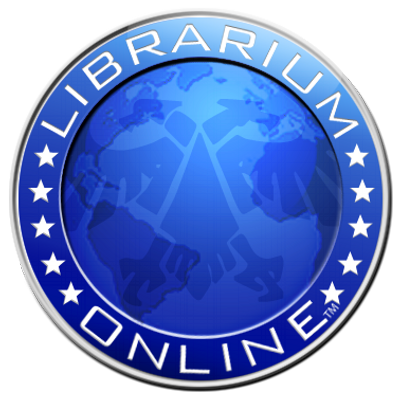 Today I'll return to a favourite couple of topics, the rise of the unit filler and the hallowed WYSIWYG. Over the last couple of years the building trend of including unit fillers has intrigued me. Initially I wasn't all that taken with the idea, a unit of troops should be a unit of troops after all! Fairly quickly though, I realised the potential for adding dynamism to units with the addition of a unit filler in keeping with the theme of the unit/army. The potential for adding lots of points of interest as well as a little height and movement to a unit won me over. I determined to add at least one filler to each of my fimir units, as as well as an aesthetic addition, they are a modeller and converter's dream. This does bring me to a point of note on fillers though, and the main reason why folks can take against them. Unit fillers should be as much, if not more work than the models they are replacing. There. A single goblin on a 40mm x 40mm base is not a unit filler in my book. A howling goblin standing on a burning dwarf baggage cart while his two mates loot the dead driver, that's a filler, and boy, do they look good if done right. Now, you can go overboard. 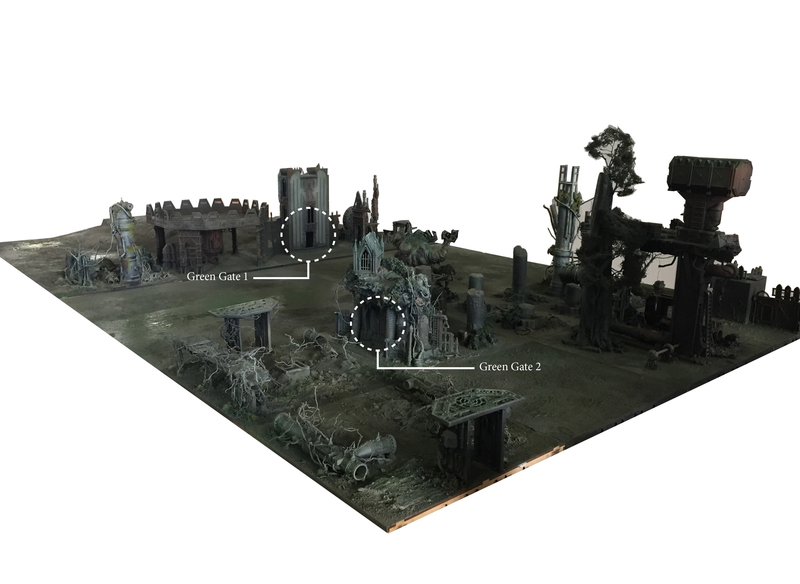 A ruined cathedral in the middle of your skeleton unit, that's too much. Some crumbling pillars here and there, now you're talking. I've seen this very thing on the Painting Tabled forum recently. Just on the cusp of too much, in my opinion, but still beautiful models. I have seen some great examples over the last couple of years, from Ben Johnson's wonderful skaven fillers, which are really small dioramas, telling the story of the army as much as providing the viewer with some gorgeous eye candy, (incidentally, Ben Johnson, what's with that guy? 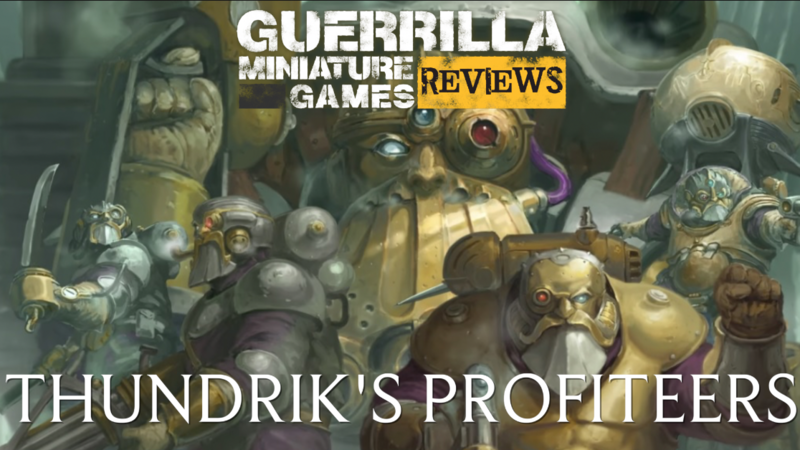 Legendary player and able to produce beautiful converted armies in jig time? Sometimes life just isn't fair.) 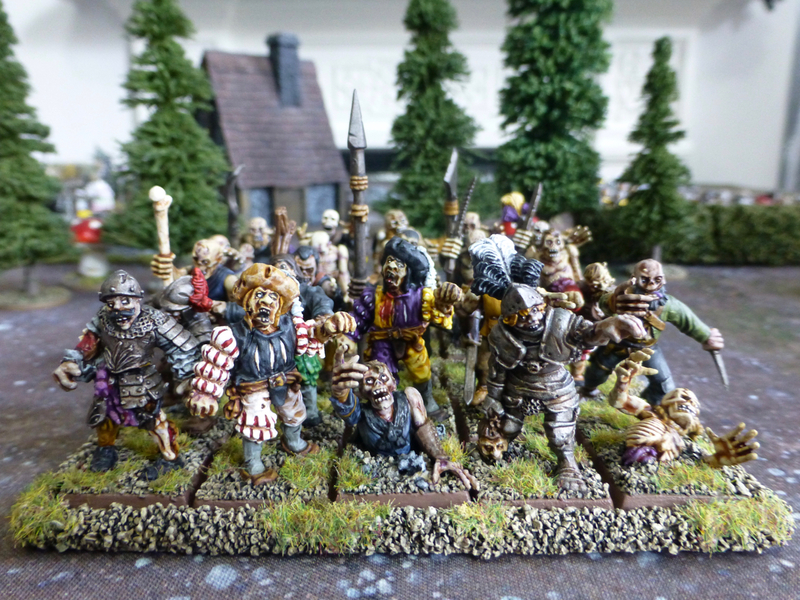 to Greg Person's excellent vampire counts fillers, it's coming to the point where I'm now mildly disappointed if I see a unit of troops without a good filler expanding the narrative of the army. And there we have the cusp of it for me. Narrative. I'm a sucker for building a fairly detailed back-story for my armies. I know it's not for everyone, but for me it makes the whole process of building, painting and playing with the army infinitely more enjoyable. It's always more fun to use a character with a name, history and favoured enemies than X lord choice. Fillers allow me to inject some of the story of the army into the actual units, building a theme that hopefully makes the army much more enjoyable to view and play against, so that you're now facing the infamous ember horde, destroyers of Ungerhaven, than just forty hand weapon & shield hobgoblins in 5x8 formation. I've put together a few fillers for the fimir so far, and they have all added to the units the sit in. 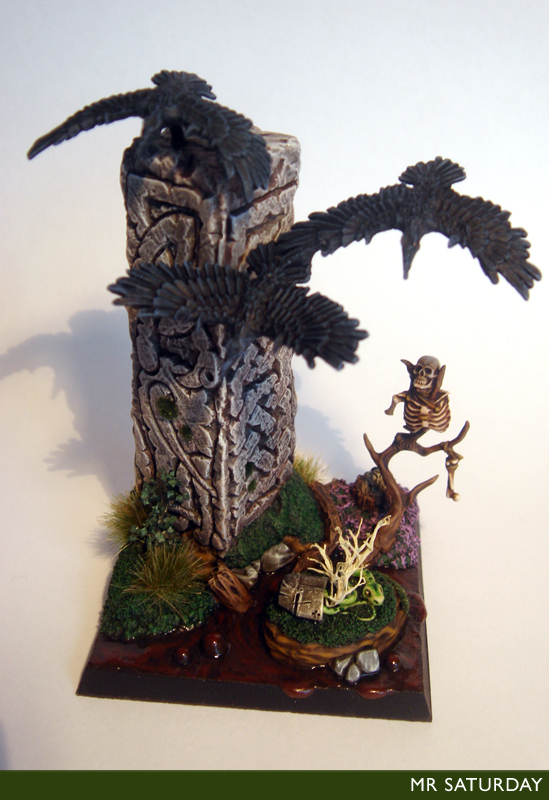 The boundary stone in the fimm unit adds some nice height and reinforces the Celtic theme, as well as allowing some movement with the ravens. My next filler, a fimm slave driver standing on a rotting swamp tree, does the same job, but also, by adding a prominent fimir model to a unit full of animated bog bodies, ties a unit that might seem out of place otherwise into the army. They are immense fun to work on, and I plan on adding a goodly lot more to other units. The second part of this post has to deal with WYSIWYG. Now, generally I'm fine with this, but how does this apply to fillers? Does the chaos warrior standing on the pile of corpses have to have a halberd if the rest of the unit does? Common sense comes to the rescue here, I can't see too many players having problems with decent fillers if it is apparent what the rest of the unit is armed with. 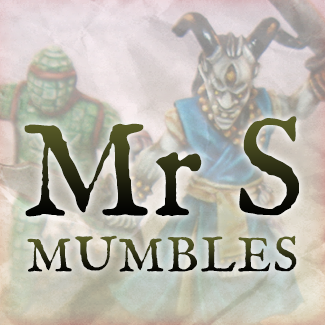 Another milestone in the life of the Mumblings, 100,000 page-views, hurrah! It's nearly at the two year mark now, and no sign of slowing down yet. Plenty of content to come with the ongoing fimir project, rants and rambles of various denominations and my unsupported opinion on whatever takes my fancy. 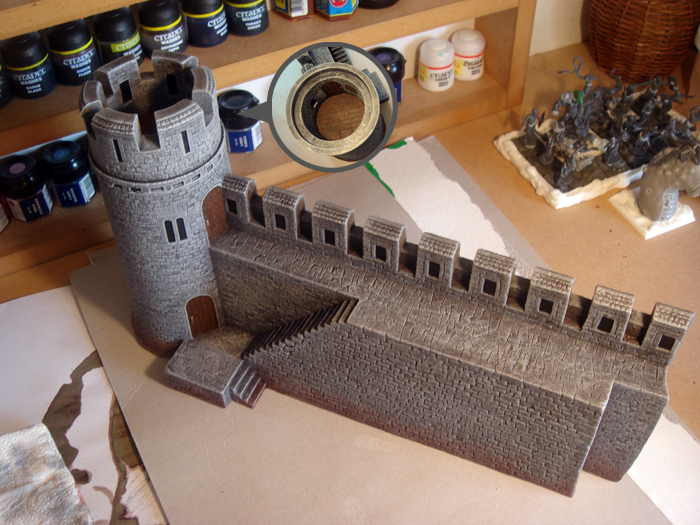 I've finished the first wall section for the Hudson & Allen Castle. It's a nice kit with a fair dose of detail. I'm assembling and painting it as is with no conversion, which for me is a little weird. There are a few interiors too, from a simple tower interior you see here to a large house interior for a more complex section, which I'll show later on down the road. I'm hoping to have this done pretty sharpish, though with 3 more identical wall sections to this one to do before I get to the more interesting parts, the next update won't be for a week or so. He's still pretty rudimentary, but I like it so far. I do like the downward pointing spear and the flowing cloak. The savage orc boar boy legs fit the wyrm model perfectly, which helps me out immensely. The other hand has a punch dagger, but I think I'll remove that so I can attach a chain to it, which will be hooked into the wyrm's upper lip so he looks like he's directing it. The saddle will be leather with some bits and bobs hooked on, skulls, weapons etc. I'd love some of the extras from the ogre stonehorn kit for this like the meat, hooks and so on. I might be jumping the gun here, as I don't know for sure if the new chaos warrior book will even have monstrous cavalry, but I couldn't resist. I'll still need to wait though, as I have no idea what base size to use. Still, it'll be a great unit to work on. 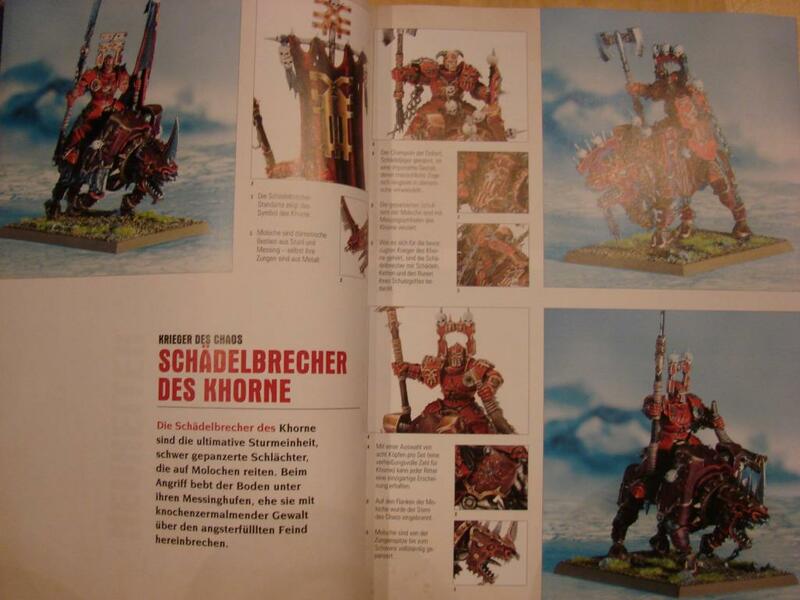 I've been keeping an eye on the various warriors of chaos rumours of late. Seems we're due a White Dwarf update next month, followed by a second wave in February next year. 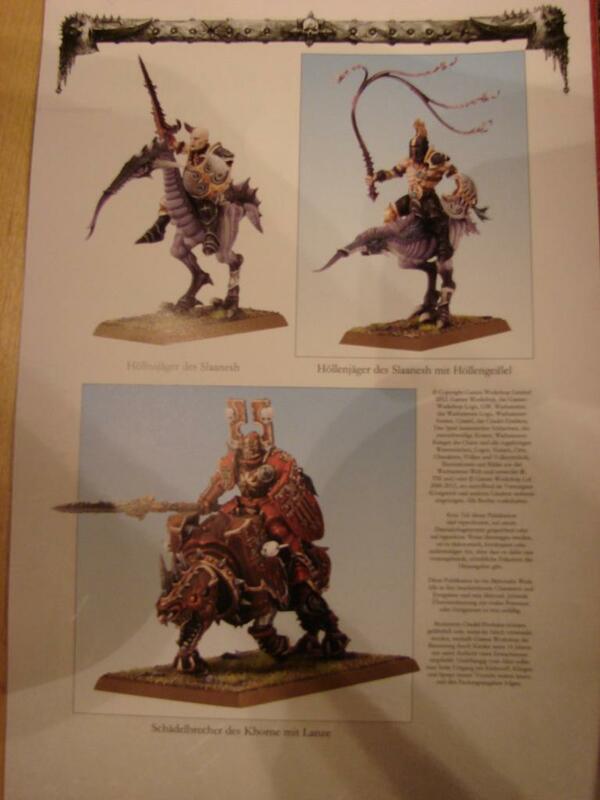 As I use the warriors list for my fimir army, I'm quite interested in these developments. The unit that catches my interest is the skull crushers, the unimaginatively named mortal juggernaut riders. This is the monstrous cavalry unit for the warriors I guess, probably on demigryph size bases, and this got me thinking about a fimir unit I've been mulling over. If the skull crushers pan out, this would give me a place in the army to field a unit of fimir marl worm riders. This is the model I'm using for the worm, from Gribbly Miniatures. He's a handsome devil, isn't he? I plan on using the plastic Games Workshop savage orc boar boys as a basis for the riders, and fimir them up some. Not too sure on the saddle yet, probably something with hooks and rough hide or leather, maybe a skull or two to garnish. I had planned on a single marl worm rider as a hero or some-such, but if the new warriors unit does come to pass I won't be able to resist a unit of these fellows.